Park Potomac, planned by Foulger-Pratt Companies, is a mixed-use development that includes Class "A" office space, luxury condominium units, luxury Brownstone townhomes, and a 156-room Kimpton hotel. Office Building E, in particular, provides seven stories of trophy quality structure. 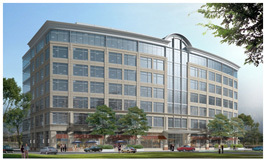 Included are six levels of office space over plaza-level retail, with two levels of underground parking. It was during the early construction phase of this building that temporary barrier cables were required around the perimeter of the parking garage to act as a guard rail system. The temporary guard rail system was to remain in place for a minimum of 2 years. KEC designed this barrier cable assembly to resist the impact of conventional passenger cars in conformance with IBC 2003, although it also served as a hand rail system. The barrier provided just under 1000 ft of railing, approximately 500 ft of which required new steel framing at every end and bend, whereas the remainder was simply attached to existing columns via a cable-and-bracket system.